What do engineering, law, education, physical sciences and business have in common? 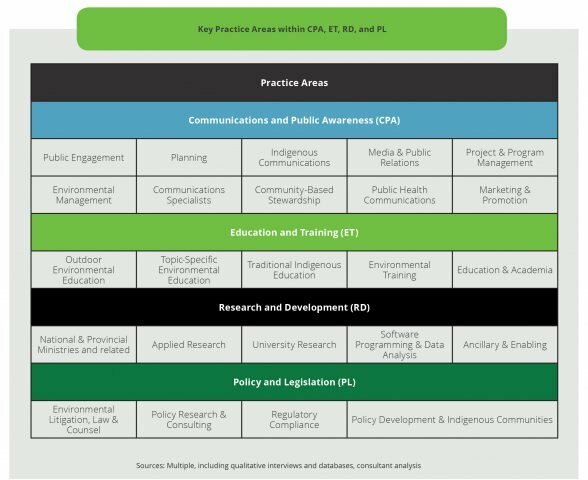 According to ECO Canada’s sub-sector model, professionals with those educational backgrounds often move between the selected sub-sectors in the diagram below. These professionals apply skills acquired in one sub-sector to other sub-sectors as they’re actively involved in environmental education, development of solutions and technologies, and the communication, research and analysis of environmental topics. Let’s explore their practice areas, demand and projected growth, and trends. 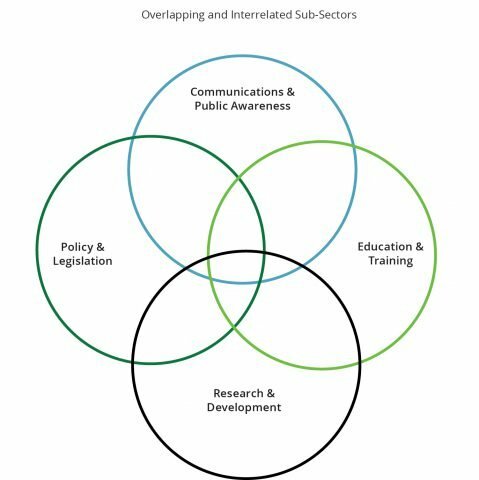 Our research show that the Communications and Public Awareness sub-sector has 10 distinct areas of practice. One of them is public engagement, where professionals promote public awareness, gather and interpret public input to shape policies or environmental projects. This kind of work may involve collaboration with engineers, biologists, geologists and planners among others. Traditional Indigenous education is one of the five areas of practice in the Education and Training sub-sector. Educators and trainers develop curriculum from an Indigenous perspective on water, land and wildlife. At the same time, they may capture the knowledge of elders. In the Research and Development sub-sector, areas are grouped by type of employer. For example, a professor working at a university. He or she may conduct environment-related research in life sciences, physical sciences and corporate sustainability. Policy and Legislation has different career paths. On the one hand, a professional may help business understand environmental regulations by communicating requirements, assuring compliance and working with regulatory bodies. On the other hand, professionals can be litigators who address issues in the courts. In the chart below, you can see the full classification of areas of practice in each selected sub-sector. Professionals in these selected environmental sub-sectors are in highest demand in Ontario and British Columbia. 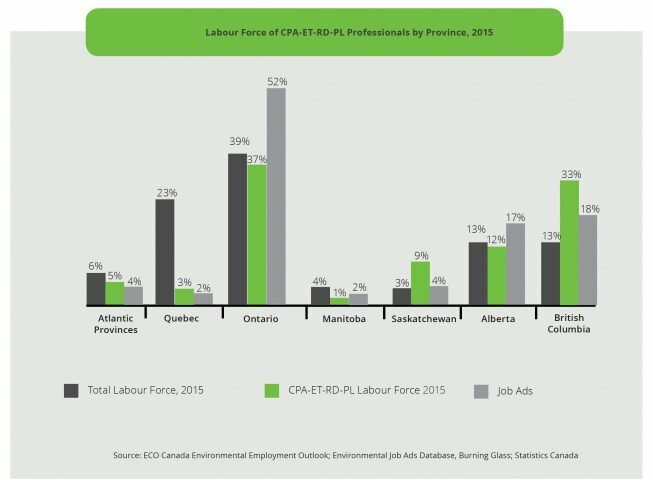 In 2015, according to our research findings, Ontario had 37% of all employed professionals in Canada. This same province had the highest number of posted jobs with 52%. British Columbia had 33% of employed professionals in that year. Alberta and Saskatchewan showed potential with 12% and 9% respectively; however, Alberta has one of the highest numbers of job ads in the country with 17%. Between 2016 and 2024, Policy and Legislation is projected to grow in employment at 65% with 31,813 jobs. Communications and Public Awareness is expected to add 31,785; Research and Development, 28,666 and Education and Training, 19,787. Learn more about our projections in our Canadian Environmental Employment-Summary Analysis report. Complicated regulations in the private sector is one of the trends affecting future demand for Communications and Public Awareness professionals. There is a need to develop more internal communications to assure corporate compliance and environmental responsibility. In the Education and Training sub-sector, there is growing interest in environmental education for youth. Programs that offer hands-on nature education beginning in early childhood are growing in popularity. For Research and Development trends, experts see potential in the private sector business growth. Consulting firms and companies may start using environmental research for projects. The urgency to fight climate change in Canada and in other countries is a top issue driving the creation of new environmental policy. Therefore, professionals in the Policy and Legislation sub-sector are likely to be in high demand.